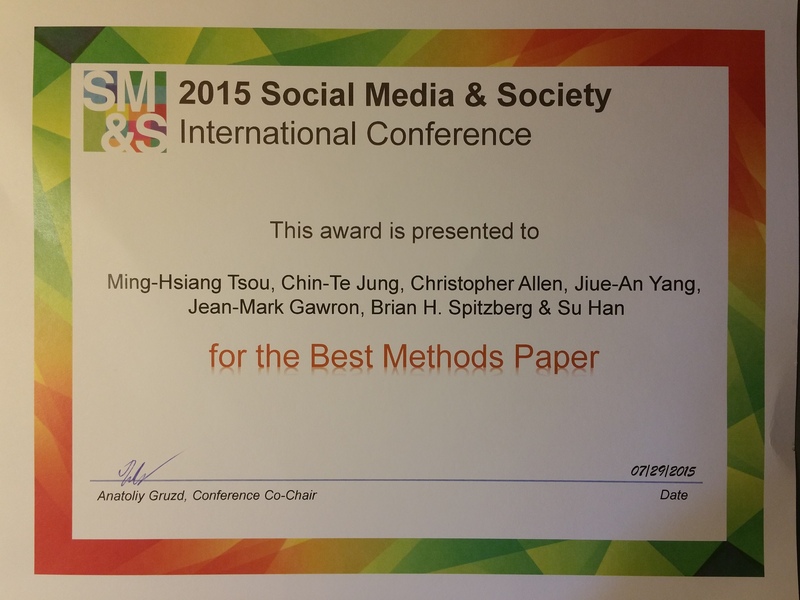 The HDMA Research Team won the Best Methods Paper Award at the 2015 International Conference of Social Media and Society (July 27 – 29, 2015, Toronto, Canada). We developed a social media analytics and research testbed (SMART) dashboard for monitoring Twitter messages and tracking the diffusion of information in different cities. SMART dashboard is an online geo-targeted search and analytics tool, including an automatic data processing procedure to help researchers to 1) search tweets in different cities; 2) filter noise (such as removing redundant retweets and using machine learning methods to improve precision); 3) analyze social media data from a spatiotemporal perspective, and 4) visualize social media data in various ways (such as weekly and monthly trends, top URLs, top retweets, top mentions, or top hashtags). By monitoring social messages in geo-targeted cities, we hope that SMART dashboard can assist researchers investigate and monitor various topics, such as flu outbreaks, drug abuse, and Ebola epidemics at the municipal level. HDMA hosts a successful 2017 Summer Specialist Meeting! 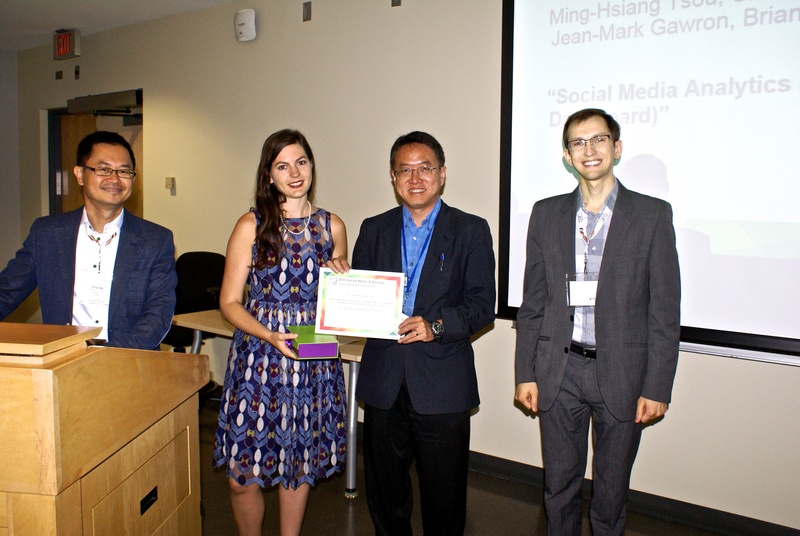 HDMA Center Hosts a Successful 2017 Big Data Hackaton! Congratulations to Dr. Brian Spitzberg for receiving two awards! 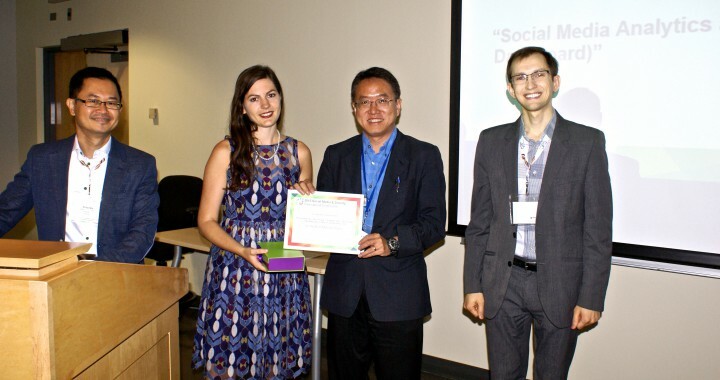 Professor Tsou gives keynote speech at the XXIII ISPRS Congress in Prague.